Stephen Colbert's Comedy Central show The Colbert Report is worth watching. 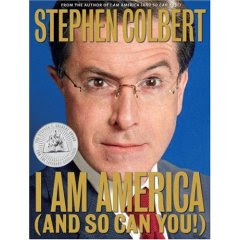 And his syntanctically disfunctional [and absurd] title "I Am America (And So Can You)" is also a must-read. A good example of satire [not] gone wrong. "Imagine going through life completely duped into thinking that there's no invisible, omniscient higher power guiding every action on Earth. It's just so arbitrary!" my favorite coinage by Colbert is his now dictionary-entered: truthiness. i enjoy him too. will get the book. One of my favorite Colbert moments was the Branson interview when a boyish Branson was in a playful mood and a slightly annoyed Colbert came close to showing his 'true' self. Good bit. Oh, I also forgot to include the very funny 'wikiality.' Def. a favorite.